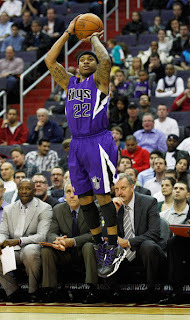 With all due respect to Isiah Thomas, who is currently stuck in basketball purgatory after being fired from FIU, I find that the case of Isaiah Thomas (who spells his name the Biblical way, and just completed his rookie season with the Sacramento Kings) is much more interesting. And this is especially true when you consider that the NBA Draft is just a few weeks away. If you were a fan of college basketball during the last few seasons you know that Thomas was one of the better guards in the country during his final two years at Washington, not to mention being one of the most exciting players to watch in all of college basketball. 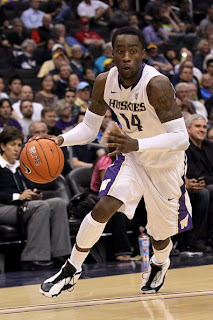 But despite how productive he was for the Huskies and despite his stunning athleticism, Thomas’ meager 5’9’’ 185 frame had many doubting whether or not he could even stick on an NBA roster, much less be a difference maker on the court. So when the Kings selected the Washington native with the final pick of the 2011 NBA Draft last June, not only did the pick not make headlines, but it didn’t mean anything to anyone who wasn’t a big college basketball fan or University of Washington alumnus. It's all revisionists' history at this point, but how else can you explain the Lakers, a team that was in desperate need of a young point guard, passing on Thomas for a player in Ater Majok, who probably didn’t have much business playing for UConn in college, much less being drafted by an NBA team (I understand that the Lakers had already drafted Darius Morris 41st overall, but at that point, why not take them both and let them battle it out?). And I basically said as much on Twitter during last year’s draft (I tweeted that right after Majok was drafted, although I was much happier when Thomas got picked). All Kenneth Faried did in college was break Tim Duncan’s rebounding record and help Morehead State upset Louisville in the first round of the NCAA Tournament, but because he played at a small college and was considered undersized for an NBA power forward, one of the most intriguing prospects in last year’s draft slipped all the way to 22nd where the Nuggets gladly scooped him up. The glaring hole in Faried’s game was easy to spot; his inability to contribute much on offense or be effective very far from the basket obviously limited how he could be utilized at the next level. At the same time, it’s hard to find players who approach the game the way Faried does today, and the effort with which he attacks the glass and plays defense are a valuable commodity in today’s NBA. Not much was expected from Thomas or Faried during their rookie seasons, but the former dazzled when given a chance to play big minutes in March and April (not to mention being named the 3rd best rookie by Grantland contributor Sebastian Pruiti), and all the latter did was average 10 points and close to 8 rebounds during the regular season, while also playing a vital role for a Denver team that reached the playoffs. I won’t claim to have predicted Thomas’ or Faried’s successful rookie seasons, and I’m probably wrong more often than I’m right around here, so this is far from an “I told you so” rant, but in looking at NBA Draft prospects, I like to take an approach of “why not?” when thinking about a prospect making an impact at the next level. When you get right down to it, almost any player that’s going to be drafted by a team has some combination of size/skill that will give him a chance to succeed in the NBA, and (unless that player is lazy/doesn’t care about basketball) generally speaking when a player fails, it’s more about them landing in the wrong spot and not being given a chance than it is about them simply not being good enough. With this in mind, I decided to take a look at a few guys in this year’s draft class who might not have very much buzz surrounding them, but who could make an impact like Isaiah Thomas and Kenneth Faried did this past season if given the chance. There were a lot of great stories in college basketball this past season, so it’s forgivable if you missed out on what Andrew Nicholson did at St. Bonaventure. The 6’9’’ senior helped the Bonnies navigate the Atlantic 10 to earn their first tournament berth in 12 years and only their sixth in school history. He posted 18.5 points per game, chipped in 8.4 rebounds, was a menace blocking shots, and Nicholson nearly helped St. Bonaventure upset Florida State in the first round of the tournament thanks to his 20 points and barrage of three pointers. What makes Nicholson so appealing is that he’s absolutely got the size and skillset that NBA teams value, and you also can’t question his ferocity around the basket. He’s not the kind of player who is content to lay the ball in the basket, and if Nicholson is catching the ball in the paint, he’s going to try to rock the rim. But probably the best part of Nicholson’s game is his versatility. After not showing much range during his first three seasons with the Bonnies, he shot 43 percent from behind the arc as a senior, and proved that he can stretch the floor at the next level. When you combine that range with his toughness, defense, and size, the “why not?” question about Nicholson succeeding in the NBA is a hard one to answer. Chad Ford currently projects him as a mid-first round pick, and it seems likely that he will make some NBA team very happy on draft night. After transferring from UTEP and having to sit out the 2010-11’ season, all Arnett Moultrie did at Mississippi State last season was average a double-double and consistently showcase an NBA-caliber game. Standing 6’11’’ and boasting a long, athletic frame (I can already hear Jay Bilas talking about how long Moultrie is on draft night) that is more than capable of getting up and down the floor, it’s not difficult to see Moultrie on an NBA team making solid contributions. A bit of an afterthought coming into his junior season, Moultrie’s name is now being mentioned as a mid-first round pick who might even sneak into the lottery when all is said and done on draft night. This has as much to do with his physical talents as it does his knack for crashing the boards, and Moultrie also showed enough ability on the perimeter this past season to have plenty of NBA front offices interested. At the same time, Moultrie will need to add some weight to his frame and he seems like the kind of player who might get a little too caught up in trying to be a small forward who shoots threes rather than a guy who hustles around the basket and runs the floor, but there aren’t too many players in any draft class who have the size and physical talent that Moultrie does. A lot of college basketball fans probably remember Tony Wroten for his free throw shooting struggles against Oregon State in the Pac-12 Tournament, but the 6’5’’ guard has a game that features a ton of upside. Wroten has the size and athleticism to play effectively at either guard position in the NBA, and he’s drawn comparisons to players like Gary Payton, Tyreke Evans, and even Russell Westbrook from GM’s and scouts. His ability to get to the basket and create his own shot will surely come in handy at the next level, and anyone who watched him aggressively knife through the lane in college could easily see how much value Wroten possesses to many NBA teams. In addition to his impressive frame, length, and athleticism, Wroten’s court vision and ability to distribute the ball at times during his freshmen season dazzled. However, he often had issues with turning the ball over, and he ended up averaging more turnovers (3.8) than assists (3.7) for the Huskies last season. Even so, Wroten’s ability to drive and dish combined with heavy doses of pick and rolls (a staple for all NBA teams) could help him blossom into a fantastic point guard in the NBA, if he’s willing to work on becoming a bit more disciplined. Wroten’s defense is another area of his game that could shine in the NBA, as he already has the necessary physical attributes to lock down opposing guards. His superior athleticism and timing helped him average 1.9 steals per game at Washington last season, and there’s little doubt that he can make an impact on the defensive side of the floor at the next level as long as he stays focused. Of course, Wroten’s also got his share of weaknesses. As evidenced by his percentages as a freshman, Wroten’s outside shooting touch still needs a lot of work. His measly 16 percent success rate from behind the arc, and his struggles at the free throw line (58.3%) can’t have many teams feeling great about his ability to put points on the board if he’s not getting to the basket. Even considering his struggles shooting the ball, Wroten’s got nearly as much potential as any guard in the 2012 draft, but whether he can make good on this upside has to be driving some GM’s crazy right now. In addition to his impressive, all-around production, White’s got an extremely strong NBA caliber frame that he should be able to utilize to create space at the next level. He doesn’t project as a dominant scorer, but when you consider all of the ways in which he can impact a game, there’s no reason to think that he can’t be an important contributor for an NBA team if put in the right situation. Unfortunately, some front offices will no doubt be skeptical of White on draft night, because he has dealt with his share of off the court issues. These issues combined with an anxiety disorder and White’s fear of flying might scare a few teams away, but if he’s able to conquer his demons, the NBA team that takes a chance on White could end up with one of the biggest steals of the 2012 draft. Back in February I wrote about Draymond Green’s fantastic senior season at Michigan State, and that he wasn’t getting enough attention for his steady production on one of the best teams in the country. And although it’s hard to argue with those who question his athleticism, size, and what position he will play on an NBA roster, I believe he offers value at the end of the first round. In addition to being a great passer, leader, rebounder, solid defender, and having above average range, Green also does all the little things that help teams win games. His size at 6’6’’ certainly limits his ability to bang under the basket, but Green is a tough player who shouldn’t have any problem rolling up his sleeves and doing the dirty work he’ll no doubt be asked to do by whichever team drafts him. In looking at Green’s NBA potential, we’re certainly not talking about a player who will become a superstar and we might not even be talking about a guy who will become a starter, but if the question is whether or not he can contribute positively on an NBA team, the answer in my mind is undoubtedly yes. His versatility and track record in college would be enough for me to take a late first-round flyer on Green, and he certainly projects as a safer pick than some players who possess a ton of upside but aren’t very polished right now. Considering they’re very different players, there’s really no sense in grouping Ezeli, Taylor, and Jenkins together, but because they played on the same college team and I’m trying to save some space, that’s what I’m doing here. 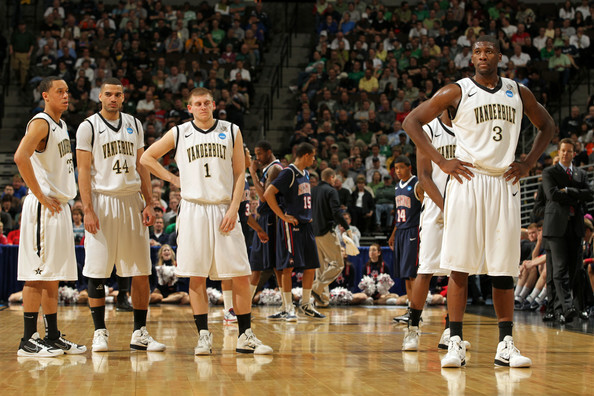 All three players possess skills that NBA teams covet, but it never really seemed like any of the three Vanderbilt stars reached their full potential in college. After finishing his junior season on a high note, Festus Ezeli looked primed for a huge 2011-12’ campaign that had the potential to push his draft stock into the middle of the first round, and maybe even give him an outside shot at the lottery. However, the combination of an early season suspension and a knee injury caused him to miss 10 of the Commodores first 12 games, and it took the 6’11’’ big man some time to round back into form. Despite a disappointing senior season, Ezeli did provide a few glimpses of his intriguing talent in late season games against Kentucky in the SEC Championship and Wisconsin in the second round of the NCAA Tournament. He’s got great size, a strong body, a knack for blocking shots, and if not for his suspension and injury I think it’s likely that we would have seen Ezeli develop into a bona fide threat with his back to the basket. As long as Ezeli is over the knee injury that derailed his senior season, he could present big value to whichever team is looking for a suitable big man in the later stages of the first round. Jeff Taylor has been a bit of a frustrating player to watch during his time at Vandy, because he has all of the potential in the world, but was never able to consistently put everything together. Possessing supreme NBA-caliber athleticism and a strong 6’7’’ frame, Taylor had the potential to dominate nearly any college game based on his physical gifts alone, and this will serve him very well at the next level. His long arms combined with all of his physical gifts will make him an instant contributor on the defensive side of the floor, and he should also excel immediately in transition. Although Taylor isn’t great at creating his own shot, his outside touch improved quite a bit during his senior season, where he hit 42.3 percent of his attempts beyond the arc. He’ll likely never be a consistent scorer in the NBA, but GM’s and scouts are looking at a very athletic, defensive minded swingman who will be able to contribute quite a bit in other areas. The rest of John Jenkins game is still a work in progress, but the one thing he does better than pretty much any player in the 2012 draft class is shoot the ball. Jenkins was one of the best (if not the best) shooters in college basketball last season, and opposing teams always had to be weary of his quick release whenever they played Vandy. He’s not overly big at 6’4’’, and as I said, the rest of his game is still developing, but it’s not difficult to see Jenkins as a deadly spot up shooter coming off the bench for some NBA team in the near future. The few times I got to see Scott Machado play last season, I always ended up with the same assessment; this guy just looks like an NBA point guard. Machado’s court vision and ease with which he got teammates open looks translated into nearly 10 assists per game during his senior season, and his pure playmaking ability might have been second to only Kendall Marshall in college basketball last year. Although he doesn’t figure to make too much of an impact scoring in the NBA, there’s always room for pure point guards with the skills that Machado possesses. At the same time, he’s certainly able to put a few points on the board himself, and the fact that Machado drastically improved his shooting percentages last season with the Gaels certainly bolsters his case for landing somewhere in the late first round of the 2012 NBA Draft. His quickness and athleticism should allow him to penetrate with relative ease at the next level, and from that point his vision and distribution skills will take over. There are some concerns about his size, and the fact that he didn’t play against the toughest competition in the MAAC probably won’t do his draft stock any favors, but considering what he can bring to the table, there’s no reason to think that either should hold Machado back from making an impact for whichever team he ends up being drafted by. It’s not an exaggeration to say that Henry Sims wasn’t on the radar of any NBA teams at this time last season. Sims first three years at Georgetown saw him play a very limited role off the bench, and it was only in his senior season that he started to turn a few heads. Even though he became an integral part of a Georgetown team that put together a 24-9 record, finished fourth in the Big East, and made the second round of the NCAA Tournament, Sims’ numbers certainly don’t jump off the page. The former backup averaged just 11.6 points and 6 rebounds per game as a starter in 2011-12’, but at times he proved to be a formidable presence around the basket for the Hoyas. His size at 6’10’’ 240 is certainly something that will intrigue NBA front offices, and his solid athleticism combined with the fact that he’s very comfortable having the ball in his hands bodes well for potentially making an impact in the NBA. Sims showcased his ability to pass the ball at an extremely high level as a senior, and the fact that he led the Hoyas in assists last season was a very impressive feat for a player of his size. There are always some concerns about guys that underachieve for most of their collegiate careers like Sims did, but based on his size and skillset, it looks like Henry Sims has the ability to help an NBA team. There are flashier players in the 2012 NBA Draft than Darius Johnson-Odom, but it’s probably not a good idea to count this 6’2’’ shooting guard out. DJO is as tough as any player in this year’s draft, and his shooting touch combined with a quick first step should give him the ability to create his own shot at the next level. Johnson-Odom can put the ball on the floor and he can also shoot it from the outside, and these skills are further bolstered by his strong, athletic frame and fearless mentality. Buzz Williams’ teams at Marquette have taken on a scrappy, hard working persona and perhaps no player is a better representation of this than Johnson-Odom. In addition to what he can do in the half court, DJO should continue to excel in transition as he did in college, and although he’s undersized, his defense will also be a valuable asset. Because of his limited size and the fact that he doesn’t have a point guard’s skillset, there’s little doubt that some teams will question whether or not Johnson-Odom can play in the NBA, but given the right circumstance, there’s little doubt in my mind that he can.